Lawn Fawn has been showing off their new stamps this week. I love the Happy Howloween set. They featured an adorable card in their video of the dogs all dressed up for Halloween around the edges of the card. I took that idea and raid my stamps to see what I could make. 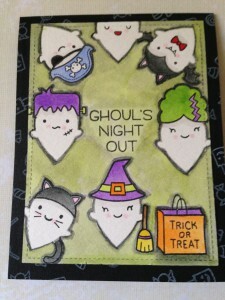 Extra Details: I started by die cutting a stitched rectangle from some water color paper. I stamped all of my images in VersaFine or Simon Says Stamp Smoke Ink. 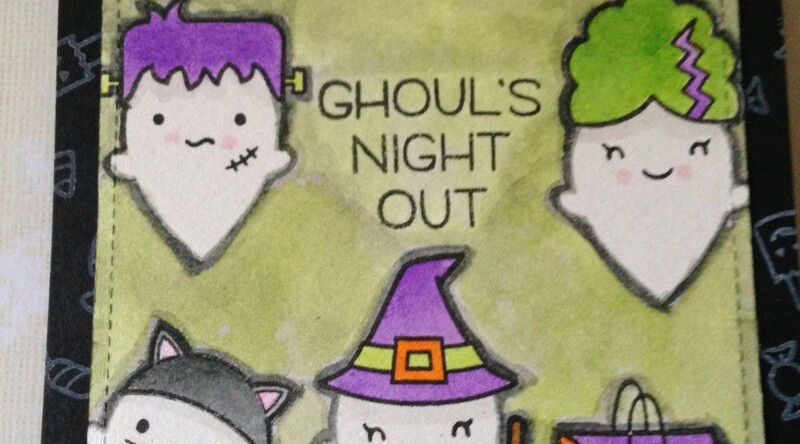 I used the grey ink for the ghost to make them appear more translucent. I didn’t really plan out my spacing and I feel like some images ended up too close together. I used my Distress Inks to water color everything in. I left the ghosts mostly white. I added a little shadow under the hats with Iced Spruce Distress Ink and a lot of water. I also gave them the rosy cheeks from Rooting for You and some Spun Sugar Distress Inks. The background is a combination of Iced Spruce, Hickory Smoke, Twisted Citron and Black Soot inks. I would add a wash of one color, decide I didn’t like it, and added another color over the top. I used the Black Soot to add some shadows around each ghost which helped them to stand out more. While the Distress Ink was drying, I created my card base. I made a top folding A2 card base out of black card stock. Using Lawn Fawn’s Yeti White Ink, I stamped the small candy images all around the edges. 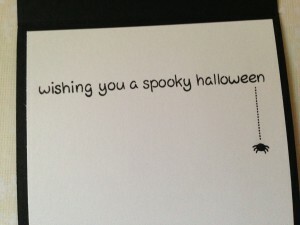 I added a liner to the inside of the card and stamped my sentiment and spider in VersaFine ink.